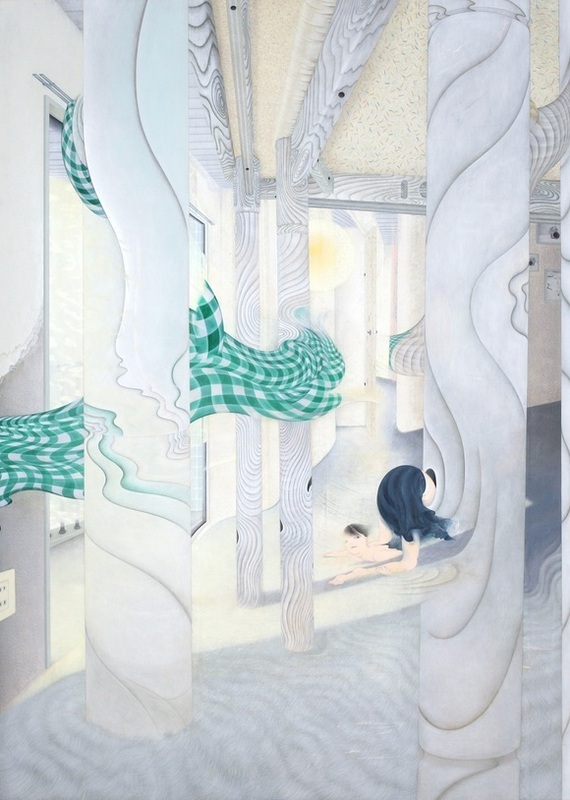 Tomoko Kashiki, A Beast Hiding Treasure, 2013, acrylic, ink, paper, linen, wooden panel, 89 x 64". Six paintings and fifteen drawings by Tomoko Kashiki make up the inaugural show at Ota Fine Art’s new space in Singapore. To create her paintings, Kashiki first covers a wooden panel with a linen cloth, then applies acrylic paint layer over layer, and finally sands it down. Only one of these six works —Flower Sun and the Moon Reflected, 2013is painted directly onto the wood, which gives that image a more grounded feel than the other five. Painting of Shells, 2013, is perhaps the most affecting work on view. The scene appears to be an artist’s studio: A blond female figure lies to one side of the composition, face up in a pool of spilled water and paint. She holds up stained hands as if in submission, or rapture. The image has a melted quality, an effect that recurs throughout this collection of works. The shells of the title appear on two canvases depicted within the tableaua gentle mise en abyme that highlights a flickering surrealism, like the end of a dream. Kashiki’s process is meticulous and deeply imaginative; she has spoken about her recent focus on creating forms that are more defined and less blurry than those of her previous works. The exhibition documents this development well by including a series of newer drawings that reflect the artist’s concern with specific details of the body, such as wrinkled skin. The sketches are repetitive and, as such, seem preparatory—as though the artist has tried to coax out her ideas via multiple iterative attempts. Though Kashiki’s subjects are distorted to varying degrees, her use of soft colors quiets the paintings’ intensity where a stronger palette might have rendered them grotesque. The artist’s decision to produce strange, ethereal scenes on a material as solid and earthy as wood achieves a similar balance. As with other opposing elements of Kashiki’s practice, this duality seems to reflect the nature of experience—at once visceral and vanishing.